You may have seen the popular accounts of heroin withdrawal portrayed in movies or on television, from Trainspotting to Requiem for a Dream. But even with so many dramatic portrayals in the media and movies, the true reality of heroin abuse and the complications of withdrawal can sometimes be hard to grasp. For anyone who cares about a person with a heroin problem, knowing the facts about addiction and heroin abuse solutions can make the difference between life and death for your loved one. According to studies, about 9% of the American population has abused opiates at some point in their lives. Most people have used opiates in the form of heroin and prescription medications such as Oxycontin (oxycodone) or Vicodin (hydrocodone). Government reports indicate that 57.4% of the people who had used heroin in the past year were classifiable as addicted to the drug, and roughly 285,000 people seek heroin addiction solutions yearly. In 2012, the Substance Abuse and Mental Health Services Administration reported that heroin was the top drug sending people to addiction treatment in Delaware, Massachusetts and New Jersey. Physical dependence and addiction can occur with any continued usage of painkillers. Even patients who are given painkillers under qualified medical supervision can become dependent on the drugs. They may even experience withdrawal after leaving the hospital and stopping the use of painkillers. Most people don’t realize they are going through withdrawal, they just think they have the flu because the symptoms of mild withdrawal are similar. Heroin abuse solution providers have to be mindful of just how deep the roots of heroin dependence reach, both physically and psychologically, in order to offer real assistance and hope. Symptoms of heroin withdrawal begin to manifest within six to 24 hours after the drug is discontinued, although the exact timing of symptoms varies with the degree of the abuser’s tolerance as well as the amount he or she last consumed. Some of the symptoms of withdrawal include sweating, agitation or physical restlessness, a sensation of heaviness, cramps, uncontrollable yawning or sneezing, tears, runny nose, insomnia, cold sweats, chills, diarrhea, nausea and vomiting, fever, and muscle and bone aches. 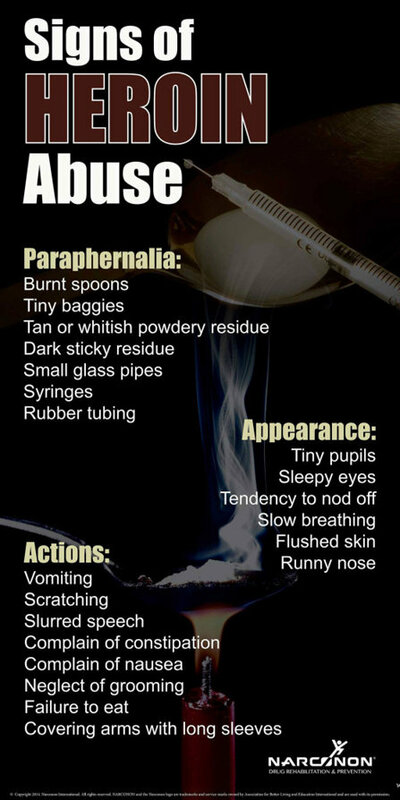 As you can imagine from this list, heroin withdrawal is a grueling process. But withdrawal is not only physical. The pains of withdrawal are also psychological and are not just a result of being deprived of the drug’s euphoric effects. Heroin withdrawal symptoms include intense depression, anxiety and malaise. It’s no wonder that many people give up and return to drug use. Complications from withdrawal are usually non-fatal and heroin withdrawal is actually less dangerous than withdrawal from alcohol or barbiturates. Symptoms usually peak 48 to 72 hours after drug use is discontinued and they subside after a week. Withdrawal from a synthetic opiate like methadone is a different story, however, taking much longer to subside. Cravings for the drug can recur even years after the abuser’s last dosage, so heroin abuse solutions need to be long-lasting and deeply effective, touching on the physical and psychological needs of the former addict on every level. Heroin abuse solutions and therapies sometimes combine behavioral treatments with medication that those in recovery are required to take daily. The drugs they are given are often themselves opioids (synthetic opiates) and addictive. The medical community argues that a person on these drugs will continue in treatment but no consideration is given to the drug-free life they could be living. The choice of inpatient or outpatient heroin abuse solutions is one of the first big decisions that a person addicted to heroin and his loved ones have to make. While outpatient therapy once withdrawal is complete may seem more economical, there is a high potential for relapse during the unsupervised hours. Inpatient treatment centers provide the chance for a stable, supervised, drug-free environment 24 hours a day, seven days a week. WIth around-the-clock support, those in recovery can take on the difficult process of physical withdrawal and beginning to face the underlying reasons for their addiction. This full-time supportive environment provides a crucial opportunity for the recovering addict to remove himself from the habits, places and people that supported or encouraged his drug abuse. Separated from his drug dealers and people he once used drugs with, he has the time and the space in which to develop new abilities for dealing with the stresses of life. 27% had relapsed and never stopped using. These rates of relapse make a compelling argument for the value of giving the former drug abuser every chance possible to truly start a new life. If you or someone you care about needs help with a heroin addiction, call us today for more information about our drug-free drug rehab solution for heroin or other illicit or prescription drugs.